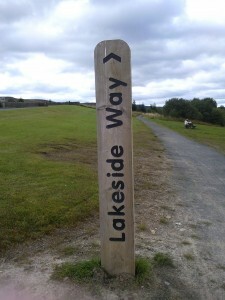 The Lakeside way is a new path that has been constructed around the spectacular Kielder Water in Northumberland. The Lakeside way is a multi user path open to cyclists, walkers, horse riders and even wheel chairs and mobility scooters. It gives visitors to Kielder Water a unique experience to get up close to the shore line and experience the vast amount of wildlife that makes Kielder Warder unique. The Lakeside way is approximately 26 miles long and it hugs the shoreline of this vast reservoir. Some of the Lakeside way routes incorporate the famous Kielder Osprey ferry so it is important to remember to check in advance for sailing schedules and even book ahead during busy times. The Lakeside Way is constructed of a good surface which is suitable for comfortable walking boots, Wellington boots or trainers. The Lakeside Way is one of England’s finest long distance paths. For those adventurous enough, it can be completed in one visit. If walking, allow 8 to 10 hours if you are fit. Allow more time if you wish to take in the scenery, have lunch or visit some of the contemporary Art and Architecture along the path. Kielder is home to an abundance of wildlife so keep your eyes open for Red Squirrels, Adders and you may even spot the famous Kielder Rabbit. 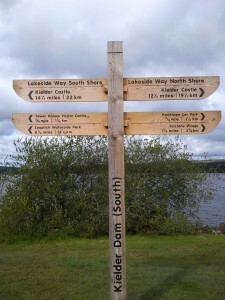 For more information on the Lakeside way see the official Kielder Water site.